The Be Bold series: #1 Be Bold~Against Bullying; #2 Be Bold~Against Fear or Worry; #3 Be Bold~Against Peer Pressure; #4 Be Bold~When Facing Problems. The series is to be an encouragement for youth, teens, and even adults. It is designed to remind you where your focus needs to be, on Jesus. Knowing who you are in Christ is the very foundation of being able to be bold. Each book begins by encouraging you in your journey with Jesus and deepening your relationship with Him, as well as knowing what God thinks of you. 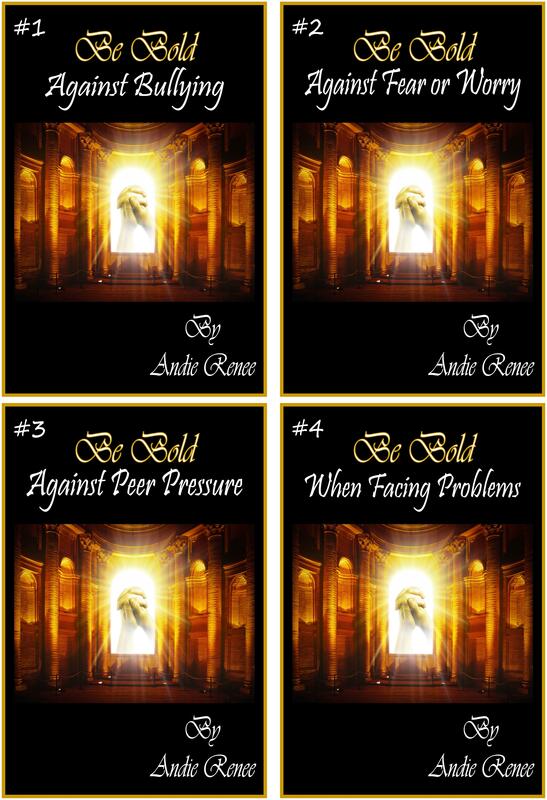 Each book further explains how all of that combined will give you boldness in dealing with bullies and other difficult people, letting Jesus heal your wounds of having been bullied, boldness over fear and worry, boldness in saying no to peer pressure, and boldness when facing problems. This book ends with a sinner’s prayer to use, or share with others. Remember, you are an overcomer through Jesus Christ. Be Bold: Complete combines all 4 of these books into 1 download in case you would like all four together. Click on my Be Bold Series at the top of my blog home page to get links on downloading the one you want.